I am very excited about the real food revolution seminar this weekend. I am going with my mother-in-law who found about this course and recommended it to me. Hopefully it helps me to expand my food knowledge and write more healthy recipes and nutrition information on my blog. I also get to see Pete Evans who is the reason why I watch MKR on TV 🙂 I’m making a big batch of beef bourguignon and some salad for my hubby now since I know I will be busy with the course this weekend and don’t want him to starve himself. 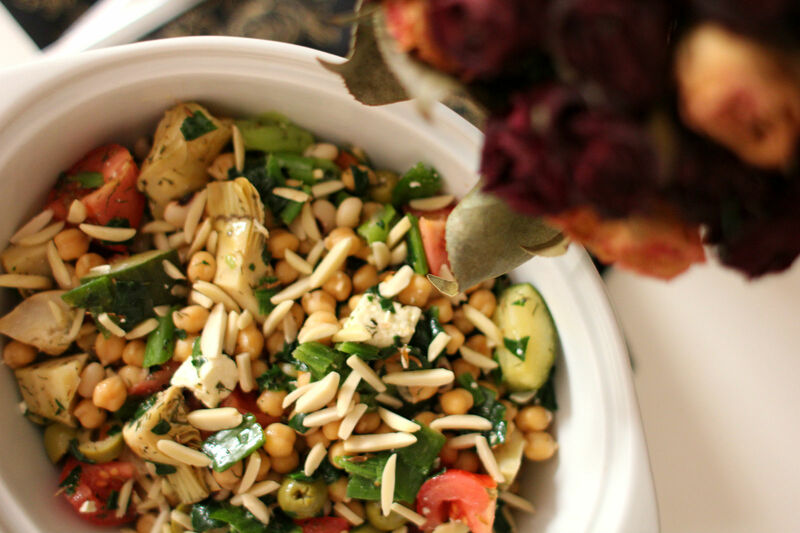 The base of this salad is creamy and nutty chickpeas. Plus Mediterranean style ingredients with a depth of the flavour and the almonds with a crunch and nutty flavour work really well with the cumin dressing. It is embarrassingly easy to put together and doesn’t take much time at all if you’ve soaked your beans overnight or you can choose to use a tinned chickpeas.